Anna Leah Berstein Simpson is Hadar's Website Administrator. She graduated from Dartmouth College, where she studied Classical Archaeology, Art History, and French. She served as Vice President of Religion and Education at Dartmouth Hillel, headed the Writing Assistant Program at the College writing center, and sang in the Handel Society. After college, Anna Leah worked as a Fulbright English Teaching Assistant at a public high school in Lyon, France, followed by two years studying Information Architecture at the École Normale Supérieure de Lyon on a merit scholarship for international students. A Kevah Teaching Fellow, Anna Leah has taught at Limmud Bay Area. 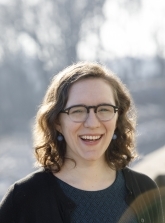 Anna Leah has worked at the U.S. National Archives, traveled extensively throughout the Mediterranean, and is a proud alumna of Camp Yavneh, Holton-Arms School, and Yeshivat Hadar.